Centrally located in the Seventh Ward, the St. Bernard Market began as a public market, part of an expansive network of public markets across New Orleans, in 1854. It carried everything from produce to livestock, including — as lore has it — enslaved people who were auctioned on the second floor of the building. At the turn of the twentieth century, the Market experienced a sharp decline and eventually shuttered in 1915. The building was subsequently transferred three times before coming to Ninth Ward native Herbert Gabriel and his brother Mike in 1954. The son of dairyman Miguel Gabriel who immigrated to New Orleans from Mississippi, Herbert Gabriel milked cows and unloaded fruit box cars with his father and, coincidentally, sold fruit at the St. Bernard Market. Mr. Gabriel would have grown up with self-service neighborhood stores like Puglia’s and Matassa’s Groceries, but he “changed the game” by pioneering one-stop shopping. 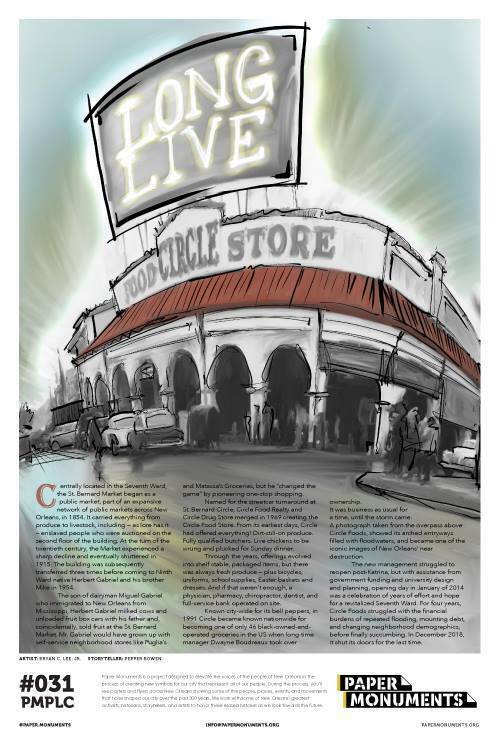 Named for the streetcar turnaround at St. Bernard Circle, Circle Food Realty and Circle Drug Store merged in 1969 creating the Circle Food Store. From its earliest days, Circle had offered everything! Dirt-still-on produce. Fully qualified butchers. Live chickens to be wrung and plucked for Sunday dinner. Through the years, offerings evolved into shelf stable, packaged items, but there was always fresh produce — plus bicycles, uniforms, schoolsupplies, Easter baskets and dresses. And if that weren’t enough, a physician, pharmacy, chiropractor, dentist, and full-service bank operated on site. Known city-wide for its bell peppers, in 1991 Circle became known nationwide for becoming one of only 46 black-owned-and- operated groceries in the US when long-time manager Dwayne Boudreaux took over ownership. It was business as usual for a time, until the storm came. A photograph taken from the overpass above Circle Foods, showed its arched entryways filled with floodwaters, and became one of the iconic images of New Orleans’ near destruction. The new management struggled to reopen post-Katrina, but with assistance from government funding and university design and planning, opening day in January of 2014 was a celebration of years of effort and hope for a revitalized Seventh Ward. For four years, Circle Foods struggled with the financial burdens of repeated flooding, mounting debt, and changing neighborhood demographics, before finally succumbing. In December 2018, it shut its doors for the last time. Paper Monuments Poster #031: Circle Food Store ~ Source: Image courtesy of Paper Monuments. ~ Creator: Paper Monuments ~ Date: March 2019. Paper Monuments, Bryan C. Lee Jr., Artist, and Pepper Bowen, Storyteller, “Circle Food Store,” New Orleans Historical, accessed April 24, 2019, https://neworleanshistorical.org/items/show/1467.